← Did Anyone Bother With This Livery Design? During the Parade of Ships for San Francisco Fleet Week, the first warship was led by a fireboat from the City. It sprayed water from its hoses to provide a focal point to the parade. As it got closer to us, the angle of the light and the mist from the fire hoses resulted in a clear rainbow forming in front of the fireboat. It looked pretty cool and I am not sure the photos really do it justice. However, here is a shot to show you pretty much what we saw. 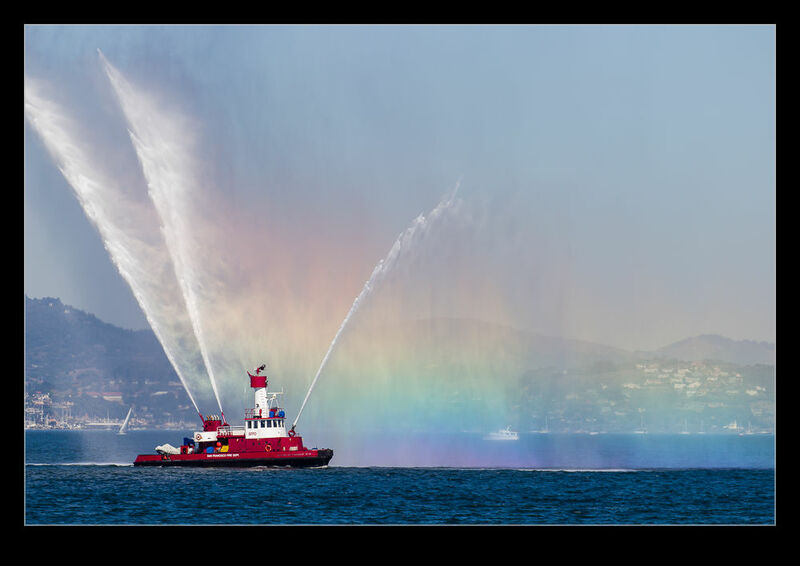 This entry was posted in Bay Area, photo and tagged california, Fireboat, fleet week, hose, light, parade of ships, photo, rainbow, san francisco, spray. Bookmark the permalink.